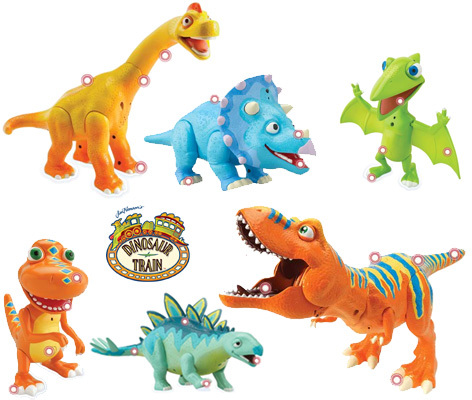 Featuring Smart Talk technology, Dinosaur Train toys are supplied by Tomy and are based on the highly acclaimed Jim Henson Company kids TV series, Dinosaur Train. A young T.Rex called Buddy has been adopted by the Pteranadon family who catch the Dinosaur Train to have adventures with a whole series of other dinosaurs all over the land. The shows have a musical element as well as separate educational segments where a palaeontologist teaches kids about the differences between present day animals and dinosaurs. The Dinosaur Train Interaction Dinosaur toys feature many different characters, all with their own personalities: Boris the Tyrannosaurus is father to Annie Tyrannosaurus – she’s full of energy and loves playing with Buddy who is a junior Tyrannosaurus and the star of the show! He's very inquiring and is happy to hypothesise a lot. Morris Stegosaurus is very forgetful and Tiny Pteranadon loves anything to do with rhymes. Tank Triceratops just loves to eat leaves all the time whilst Ned the Brachiosaurus occasionally acts as a conductor on the Dinosaur Train. Each Dinosaur Train toy dinosaur has a variety of moving parts or buttons – and when pressed they make sounds like stomping feet, chomping food or even the swishing sound of a moving tail. Most importantly, they can talk to each other! As well as the interactive dinosaurs, Tomy have produced a series of other toys like train tracks complete with dinosaurs, plush versions and even a series of smaller collectable figures. Other licensees to have also been confirmed include HarperCollins, Egmont and Samuel Eden & Son. In addition, Uncle Milton produce science-themed, educational toys inspired by the prehistoric cast.